Bet you thought the only natural ways to fight cancer had to take place in the kitchen or gym. If so, you’re missing out. Because it turns out adding this two minute bathroom ritual to your regular routine could help put the brakes on cancer. So just what is this two minute miracle? Incredibly, it’s simply daily flossing. That’s right, the thing your dentist has been after you to do your whole life could be what stops cancer in its tracks. But that’s not all. Flossing has some other unexpected and even life-saving health benefits. We’ll start with cancer, because it’s a biggie. A major study by universities in Texas and New York of over 65,000 post-menopausal women confirmed how critical oral health is to staying healthy. Women with gum disease had a significantly higher risk for cancer than women who had a healthy mouth. And women with a history of gum disease were twice as likely to end up with gallbladder cancer, and three times as likely to develop esophageal cancer. In another long term study, published in the journal Cancer Research, researchers tracked over 100,000 people for a decade. They found that certain oral bacteria are associated with higher rates of esophageal cancer. Brushing and flossing daily can help keep bad bacteria at bay. And yes, that’s despite some recent rumblings that it may not be as useful as we once thought. The fact remains flossing helps wipe out bacteria breeding grounds by removing food debris and plaque from hard to reach places. It turns out a two minute flossing session could be protecting your brain too. A current study underway at the West Virginia School of Dentistry has uncovered an association between high levels of oral bacteria and poor memory. People with the most mouth bugs performed the poorest on memory tests. But even worse, they had higher markers of the kind of inflammation that scientists say is associated with deadly Alzheimer’s disease and dementia. The research is still in its early stages, but it’s already raising a lot of smoke. And in light of an earlier study which found Alzheimer’s patients are more likely to be harboring the bacteria associated with gum disease than their healthier counterparts, it’s clear that taking extra care with your brushing and flossing is a no brainer. Your heart health and your oral health are tied together in a couple of different ways. First, there’s the inflammation link. When your oral health isn’t up to par, the swelling you can see (and feel…ouch!) around your teeth and gums doesn’t always stay isolated to the mouth. The longer it hangs around the more likely it is that it will spread throughout your system. In other words, it transforms from acute inflammation in your gums to systemic inflammation affecting your entire body. And since chronic inflammation is a primary cause of heart disease, it can take a real toll on your heart. But the link between mouth health and heart health doesn’t end there. Experts say folks with gum disease also have elevated levels of certain bacteria both in their mouths and around their hearts. Taking a few minutes out of your day for flossing won’t just help keep your pearly whites in perfect shape. It could also help keep your ticker in tip top health too. It turns out there’s even a connection between oral health and your kidneys. According to a study out of Case Western Reserve University, people with gum disease were twice as likely to have chronic kidney disease as folks with healthy mouths. 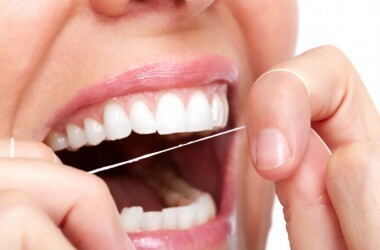 A gleaming healthy smile alone is enough of a reason to make flossing a regular part of your routine. But it turns out the simple two minute routine may even help save your life too. Apparently “Pulling” – using coconut oil to rise your mouth for about 5 minutes twice a day helps to kill off bacteria in your mouth.Do not swallow the oil but spit it out.